2017 is an important year for our community: it marks the 50th Anniversary of our founding and 50 years of leadership for Downtown Santa Barbara. Our Gala Honorary Co-Chairs Mayor Helene Schneider and Roger Durling welcomed business owners and supporters to help us celebrate! 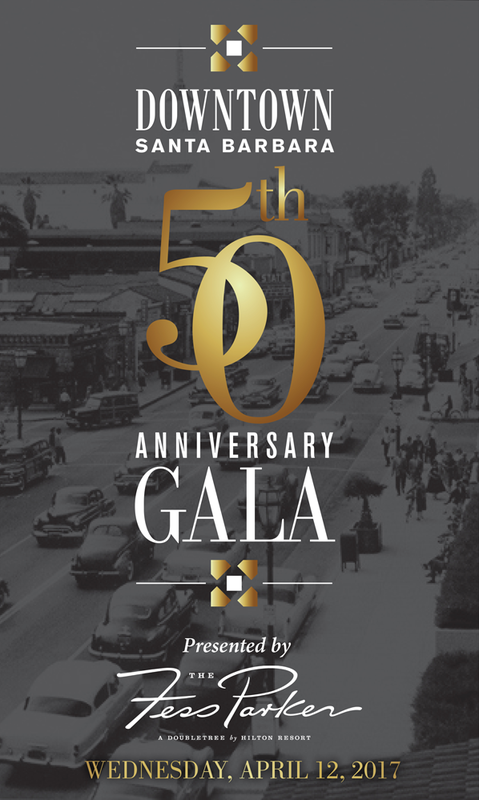 Celebrating 50 years of Downtown history and accomplishments, the Downtown Organization of Santa Barbara, Inc. hosted a 50th Anniversary Gala on April 12, 2017. 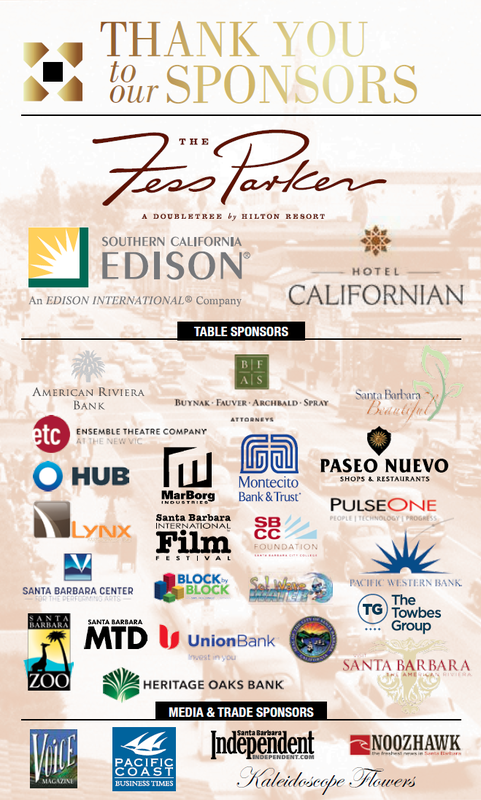 On this lovely spring evening, guests mingled in the plaza of the Fess Parker DoubleTree Resort, the Gala Presenting Sponsor. Exploring the Honor Wall, sponsored by Southern California Edison and celebrating 40 years of Downtown Santa Barbara’s Citizens of the Year, was a highlight of the evening. This annual award has honored civic leaders, social advocates, visionaries, members of the media and the arts community, and is highly anticipated each year. Toasts to the history and continued success of Downtown Santa Barbara followed a video, with heartfelt testimonials from several former Citizens of the Year. View the 50th Anniversary video on the Downtown Santa Barbara website, here. The Citizen of the Year Honor Wall is scheduled to be on public display soon, throughout various downtown locations. The 2016 Business Champion of the Year Award: A thrilled Amy Cooper of Plum Goods (909 & 911 State) accepted the award with a promise – and rallying cry - to continue supporting State Street. Cooper recently doubled her retail space by taking over an empty storefront next to Plum Goods. She serves on the DSB Board of Directors and chairs the Retail Committee. The 2016 George Gerth Volunteer of the Year Award: from Pacific Western Bank, Tracy Pfautch was surprised but delighted to be honored for doing what she loves – being a part of Downtown Santa Barbara. Pfautch has been a DSB Director for 2 years, and serves on the Nominating and Executive Committees. “She even volunteered – four times – to help with tonight’s Gala event,” said presenter Kate Schwab, DSB Marketing & Communications Director. The 2016 Citizen of the Year Award: Roger Durling and Maggie Campbell announced Mayor Helene Schneider as this year’s well-deserved winner. Mayor Schneider was honored for not only her years of public service to the City of Santa Barbara, but for her strong support of arts, culture, entertainment and commerce. Her leadership to help secure the downtown parking assets following the dissolution of RDA was also part of this worthy recognition.